Our VTX 230lb colored solid rubber bumper plates have quickly become the industry standard for quality and value. The plates sport bright colors that really stand out so we paired them with our institutional quality Olympic bar and collars to make a multi-functional set that’s perfect for beginner or advanced lifters. Our VTX line is built and engineered to our demanding standards for active lifters looking for rugged durability. In this package you get our GOB-1200 Olympic bar, a pair of spring collars, and one pair of each of the following bumper plates: 10 lb., 25 lb., 35 lb., and 45 lb. This set is perfect for home or institutional use. Our VTX 230lb Colored, Solid Rubber Bumper plate with solid steel insert is a high quality, branded bumper plate, engineered to our demanding standards. It routinely outperforms other, more expensive models of its kind, making it the perfect value solution for gym and institutional use. GOB-1200 - 44lb 7' Chrome Coated Power Bar has pinned sleeves. It is a 1200 lb. statical test bar, 32 mm in diameter with medium diamond knurling. No Center knurling. Great for commercial and home gyms alike this is a very affordable and durable bar! Call 1-800-875-9145 to speak with one of our fitness advisors with any questions you may have about any of our barbells and plates. Get Motivated! - Step up your fitness program today and go to FitnessZone.com to order your VTX Colored Bumper Plate Weight Set OSS-275SBP. 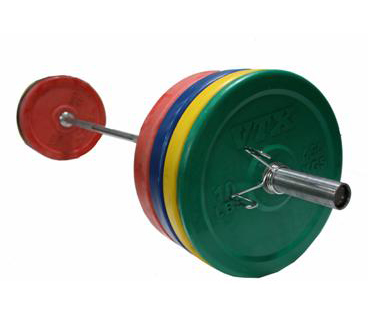 Order your VTX 230lb Colored Bumper Plate Weight Set OSS-275SBP from FitnessZone.com today!